Related Article: EKG of electronic pacemakers. 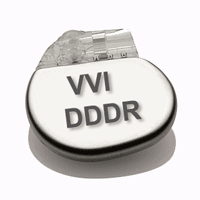 The pacemaker nomenclature established by the North American Society of Pacing and Electrophysiology (NASPE) and the British Pacing and Electrophysiology Group (BPEG) is designated as NBG code for pacing nomenclature 1. Modified from Bernstein AD. et al. The revised NASPE/BPEG generic code for antibradycardia, adaptive-rate, and multisite pacing. North American Society of Pacing and Electrophysiology/British Pacing and Electrophysiology Group. Pacing Clin Electrophysiol 2002 1. D: Dual chamber pacing (both A and V). The second position indicates the chambers in which spontaneous cardiac depolarizations or interference signals may be detected, for the purpose of triggering or inhibiting antibradycardia pacing as indicated in position III 2. D: Dual chamber sensing (both A and V). The third position refers to the mode of response. An I indicates that a sensed event inhibits the output pulse and causes the pacemaker to recycle for one more timing cycle; T indicates that an input pulse is triggered in response to sensed event, and D means that both T and I can occur 1. The fourth position is used only to indicate the presence (R) or absence (O) of an adaptive-rate mechanism (rate modulation). Unlike the remaining positions, the fourth letter is unique. It refers to the automatic adjustment of the pacing rate to compensate for chronotropic incompetence. O: Absence of rate modulation. R: Presence of rate modulation. The fifth position is used to indicate whether multisite pacing is present in one or both of the atria, one or both of the ventricles, or any combination of A or V as just described. Stimulation sites may be in each atrium/ventricle or in more than one stimulation site in either atrium/ventricle, or any combination of the two 2. A: One or both of the atria. V: One or both of the ventricles. D: any combination of A or V.
(V) Ventricular pacing, (V) ventricular sensing, (I) pacing inhibited by sensed spontaneous ventricular depolarizations, (O) no rate modulation, (O) no multisite pacing. This mode is often used in patients with permanent atrial fibrillation and complete AV block or severe bradycardia. (D) Atrial and ventricular pacing, (D) atrial and ventricular sensing, (D) inhibited by atrial or ventricular sensing and ventricular pacing triggered after an atrial sesing, (R) rate modulation, (D) no multisite pacing. This mode is often used in patients with sick sinus syndrome or atrioventricular blocks. AOO, VOO or DOO: Asynchronous atrial, ventricular or dual pacing; no sensing, rate modulation, or multisite pacing. AAI: Atrial pacing inhibited by sensed spontaneous atrial depolarizations; no rate modulation or multisite pacing. DDD: Dual chamber pacing (normally inhibited by atrial or ventricular sensing during the alert portion of the VA interval or by ventricular sensing during the alert portion of the AV interval, and with ventricular pacing triggered after a programmed PV interval by atrial sensing during the alert portion of the VA interval); no rate modulation or multisite pacing. DDDR: Dual chamber, adaptive-rate pacing; no multisite pacing. DDDOV: Dual chamber pacing without rate modulation, but with multisite pacing (i.e., biventricular pacing, more than one pacing site in one ventricle, or both features). VVIRV: Ventricular inhibitory pacing with rate modulation and multisite ventricular pacing (i.e., biventricular pacing or more than one pacing site in one ventricle). This mode is often used in patients with heart failure, chronic atrial fibrillation, and intraventricular conduction delay.